The UFC has finally found a home for UFC 147 which will take place on June 23rd, and will be the third UFC event on Brazilian soil within the last year. The sporting arena known as “Mineirinho” will host the event and is known as one of the largest and most traditional indoor sporting arenas in Brazil. The agreement will be made official on May 15th, with Brazilian standout Vitor Belfort in attendance. 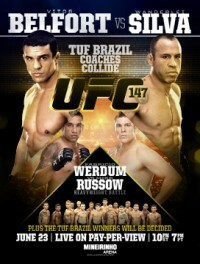 Belfort will headline UFC 147 against another Brazilian star in Wanderlei Silva. The two fought once before back at UFC Brazil in 1998 with Belfort taking Silva out via TKO in 44 seconds. This event will also host the Brazilian version of TUF finals. The last two events that have taken place in Brazil where both staged in Rio de Janeiro. Stay tuned to ProMMAnow (www.prommanow.com) as more details emerge about the fight card.